Pets! We all have them and they are often such an important part of our lives. That’s why we here at Magnificent Moments Weddings are loving the newest trend in weddings, including pets! 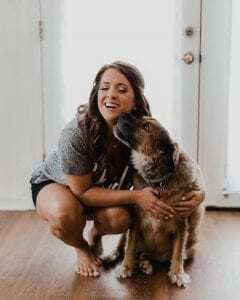 From elaborate proposals to walking their brides down the aisle, pets are becoming an important, and might we say cute, part of many couples weddings. 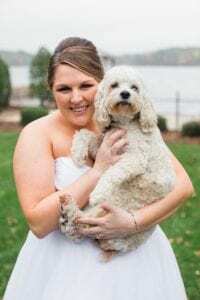 So we wanted to share some fun ways to allow your furry friends to make an appearance on your big day! 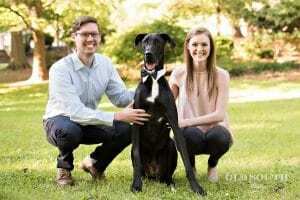 Since pets are such a big part of the family you can include them in your wedding day announcements. Use your pets in engagement pictures, like Carolina and Tim did, aren’t they adorable? Pets can be a part of your save the dates and even invitation. Couples are finding more and more creative ideas to show off their beloved animals. I mean just look at these cute ideas! Ring bearer or flower girl, let your pet be the center of attention by letting them walk down the aisle, Katherine did on her big day! The ceremony is all about cementing you and your fiance as a family. So it only makes sense that all members of the family be present, including pets! This is a great way to show everyone you love just how much your pets mean to you. While you are getting ready, enjoy a few minutes ahead of the wedding with your furry friend! Katie had fun with her childhood pet right after her first look. Don’t have a pet-friendly venue? Then let your pets be there in spirit! Name your signature cocktails after them, just like Elizabeth and Dennis did, and they even added their furry faces to the menu! You could also use their likeness as a cake topper, or even craft an amazing grooms cake in their honor. Even if they can’t be there physically, you can still know that they were represented on your big day and let guests know how much you love them! Looking for someone to help make your dream day a reality? Contact Magnificent Moments Weddings today! We would love to help you plan the wedding of your dreams!